Sam Astley & Charlie Pyne, Karl Chandler, Kent Valentine, Julia Clark and Tony Law. 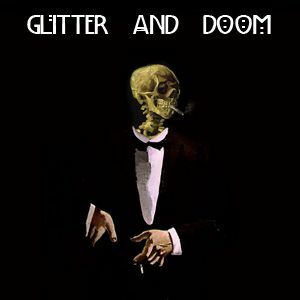 Recorded Sept 1st 2010 at the Betsey Trotwood in Farringdon, London; Glitter & Doom is an experimental comedy night where comedians perform their jokes and stories to a live music score. This episode features Kent Valentine, Julia Clark, Karl Chandler & Tony Law on jokes; Sam Astley on guitar & Charlie Pyne on double bass. For more info or to book tickets to see Glitter & Doom visit http://theglitteranddoom.wordpress.com or find us on facebook. The podcast is split into chapters so you can skip between sections to listen to specific acts, or you can consult our hand time chart below to see just when your fav comedian hits the stage (so to speak).